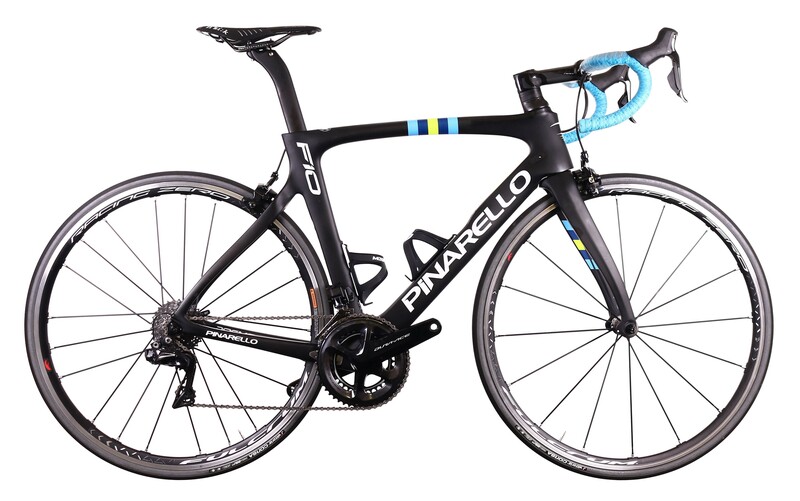 The all new Pinarello Dogma F10 the bike that carried Chris Froome to an impressive 4th Tour de France victory. The F10 is lighter, stiff and more aerodynamic that is sister bike the F8, teamed up with the latest Shimano Dura-Ace 9150 Di.2 this has to be the ultimate ride experience. Pinarello Dogma F10 achieves new significant numerical data, but more importantly, maintains the unique ride feeling, which has made previous Pinarello Dogma bikes unbeatable. Whoever rides the new F10 Dogma, will immediately perceive the extraordinary work done by our team, in creating a streamlined and aerodynamic bike without losing the typical characteristics of Dogma: a powerful and responsive bike for every track. Pinarello manufacture more size variations than most other brands, this is so that you, the customer, end up with the perfect fitting bicycle. It does however make sizing slightly more complicated but our Pinarello trained staff are here to help with any enquiry so please get in contact if you are unsure. Please be aware that different manufacturers use different methods for sizing their bikes, a 53cm Pinarello is not the same as a 53cm Specialized for example. Most people will suit more than one frame size, such are the small increments between bikes. It is then down to rider preference which frame size they go for based on factors such as type of use and specific body measurements. If starting from scratch first calculate your height. This is best done stood with you back against a wall and without wearing any shoes. The sizing guides below can give a rough estimate based on your height. Saddle height can also be used alongside height to give a better estimate of frame size. Saddle height can either be measured from your existing bike setup or approximately calculated from your inside leg measurement. If using your existing bike setup you can measure your saddle height from the centre of the bottom bracket to the top of the saddle, in-line with the seat post. If measuring your inside leg measurement stand with your back against the wall having removed your shoes, hold a book up into your crotch with a similar pressure as from a bike saddle and get someone to measure from the floor to the top of the book. Inside leg measurement is not your trouser length.